There is a new Digital Gallery from the University Libraries showcasing images and digital media from the archival collections and branch libraries. 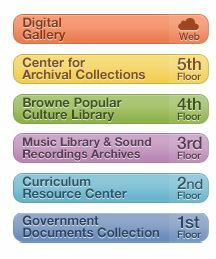 Right now there are three collections in the Digital Gallery, including Historic Sound Equipment from the Music Library and Sound Recordings Archives. This collection displays photographs and information about recording and playback machines from eras past. The second collection is the Vintage Paperbacks Collection from the Browne Popular Culture Library. The photos contained within depict the rich history of the paperback book from the 1940s through the 1970s. Cover photos from the books illustrate the changes in the popular reads of Americans over this period, as well as the changing role of women. The collection is also useful for studying the work of the artists who illustrated the covers. The last collection in the Digital Gallery is Centennial Memories contains stories, artifacts, and images donated by students, faculty, and staff of Bowling Green State University. Click here to visit the Digital Gallery. These collections are unique and not to be missed! It’s a great opportunity to learn more about BGSU!